Apple stock is cheap. Look at its reliable stream of meaningful cash flow, and you'll see why. Apple (NASDAQ:AAPL) stock is still looking sweet. Even when you leave out the prospects for new categories the company is working on, the fundamentals alone are downright convincing. Its enduring cash flow may simply be worth more than the market is valuing it at. Rendering of Apple Campus 2. Apple's next-generation headquarters is currently under construction. Image source: Apple. Consider these three factors that point to an undervalued cash cow asset. First, and foremost, Apple has staying power. Google's Android mobile operating system that competes with the iOS ecosystem is certainly getting better, but Apple isn't going anywhere. In the U.S., Apple's most important market, Apple is still the dominant force. To see how, just look at the health of Apple's largest and most profitable business segment: smartphones. Apple's iPhones boast a 41.6% share of the U.S. market, according to a June report from comScore. This trumps second-place Samsung, who has a 27.7% share of the market. And in China, where one of Apple's most important growth opportunities lies, the company is dominating high-end smartphone sales. Of the 27% of smartphone sales in the country in the $500 plus category, iPhones have about an 80% share, according to Chinese app analytics firm Umeng. Combining Apple's leadership at the high-end with its "sticky" ecosystem, there's no sign that Apple's customer retention or pricing power will begin to decline any time soon. In other words, Apple's stream of cash flow is here to stay -- and possibly even grow if Apple can grow its smartphone business as the overall segment continues to swell. Apple stock is cheap, or at least reasonably priced. There's no if, ands, or buts about it. Consider, for instance, that Apple stock trades at a price-to-earnings ratio of just 15.3. Compare that to the S&P 500's P/E of about 19.3. 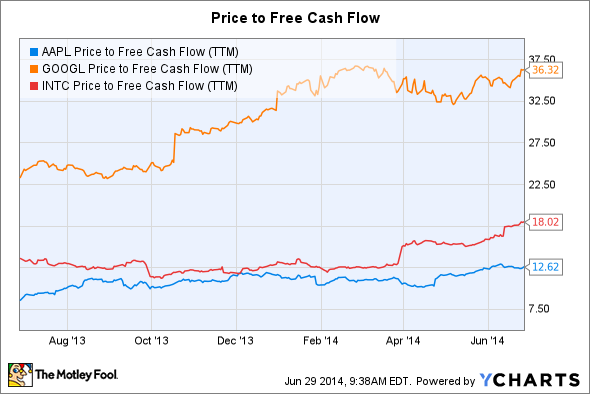 Looking past earnings to free cash flow, the stock looks even more enticing. My favorite argument for owning Apple stock lies in its uncanny ability to consistently generate loads of cash. Consider: About 26 cents of every dollar of Apple's sales ultimately ends up turning into free cash flow -- or the cash left over after operations and capital investments are taken care of. What can businesses do with free cash flow? Save it for future capital investments, pay it out in dividends, repurchase shares -- all the good stuff that builds shareholder value. Given the scale of Apple's cash flow, it's impossible for the company to continue reinvesting all of its profits back into the business. And, fortunately, Apple isn't hoarding this cash flow. The company has both a generous share repurchase program and a meaningful dividend. And perhaps best of all, Apple gave investors reassurance this April that it plans to increase its dividend on an annual basis, going forward. This means investors who buy Apple shares today will watch their dividend payout grow in the coming years. Even without accounting for future increases, however, the dividend is yielding a return of 2% -- one that easily crushes the return most people see in their savings account. In a conservative forecast, here's how the payout could look in the coming years. Not a bad dividend for a stock that costs only $91.98. Combining Apple's staying power, a conservative valuation, lucrative cash flow, and a shareholder-friendly plan to return cash to shareholders through repurchases and dividends, Apple stock may be poised to outperform not only your savings account, but the broader stock market as well.